Company | Poverty, Agony, Distress & Want! The Port Arthur, Duluth and Western Railway began as a local venture. When the Thunder Bay Colonization Railway was incorporated in 1883, many local businessmen were involved. This list included Thomas Marks and Simon Dawson, as well as transplanted US Civil War veteran E. A. Wild. Wild was most likely the one responsible for attracting outside investors, such as New York capitalists Harmon D. Hull, George Hart and Theordore Myers. When the corporate name of the PAD&W was changed in 1887, and construction began in 1889, most of the outside investment had disappeared. The new company president was Marks, with D.F. Burk as Vice-President. Local politican James Conmee, along with George Middleton, had been awarded the contract to build the railway. When the railway opened in 1893, the board elected a new and surprising president; Toronto businessman William Rees Brock. With no prior connection to the railway, Brock appears to be somewhat of an anomaly. However, as a director of the Toronto General Trusts Company (who were managing the estate of Leys, who had passed away in 1892) and with connections to the Bank of Commerce, Brock was obviously securing the investments of those companies. In the following years, controlling interest of the railway would gradually pass from the local investors to the Toronto interests, especially the Toronto General Trusts. By 1899, when the bankrupt railway was sold, the board of directors was entirely composed of Toronto businessmen. 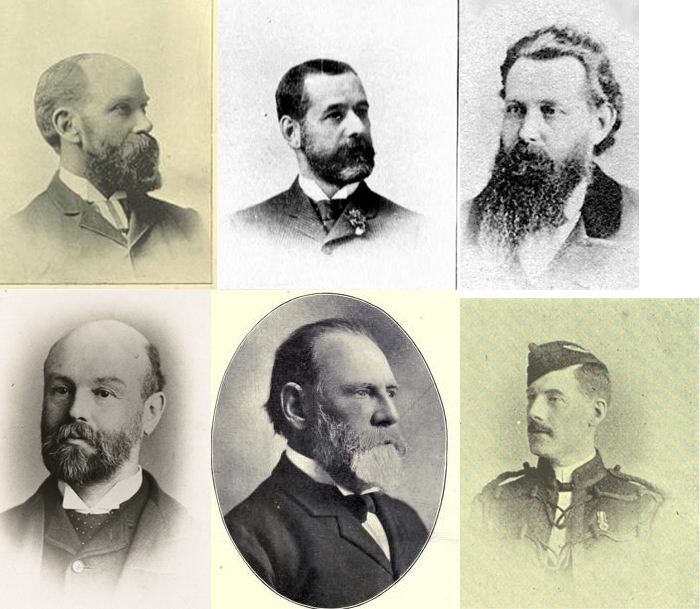 Members of the “Toronto Syndicate.” Clockwise from top left: Hugh Blain, J.F. Eby, David Blain, A. Burdett Lee Jr., A.B. Lee Sr. and John Leys. For more information on the PAD&W directors, please click here.